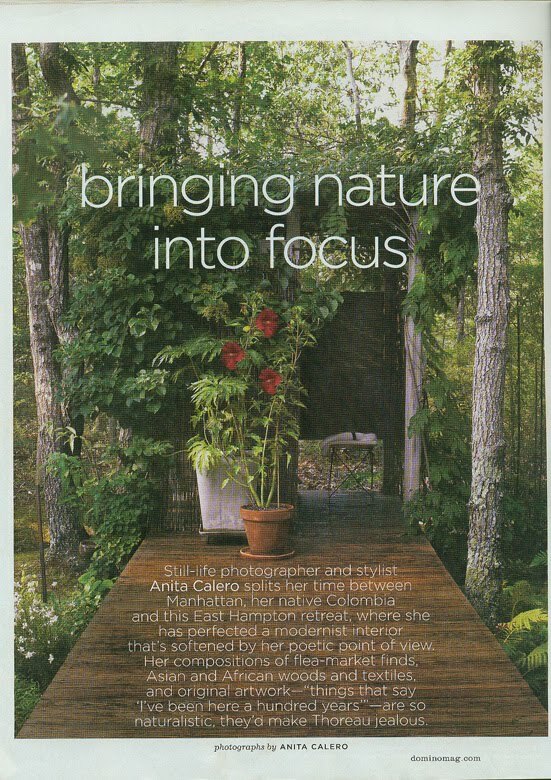 One of my all time favorite Domino Magazine stories was this one about photographer and stylist Anita Calero's East Hampton, NY weekend retreat from the June/July 2007 issue. (I don't have a scanner, so I scanned these quickly at a friends and am not happy at the quality-- oh well). This room (above) is pretty much perfect to me. I've used this as the defining image for what my mom's house should feel like when it's finished. 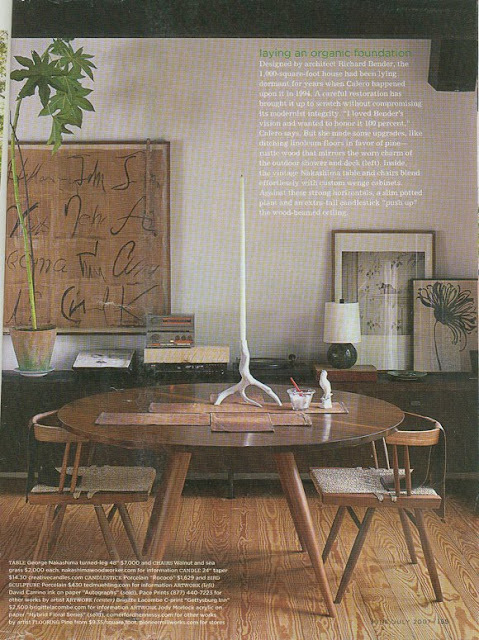 Wood floors, dark beamed ceiling, leggy mid-century furniture, interesting art, and a cool house plant. Perfect. Also love the chunk of wood that is dividing up the stereo equipment, which completely distracts the eye from the stereo being out in plain sight. 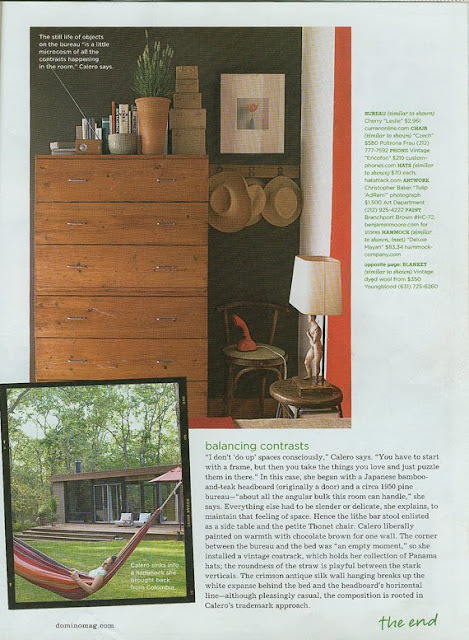 In the February 2007 issue they featured details of her home in the Renovation Notebook section and showed these shelves, which I plan to copy asap. The chunks of wood are a clever take on the ubiquitous cinderblock and plank shelves that used to be such a staple of dorm-room-on-the-cheap furnishings in the days before IKEA came to the U.S. This last image was poached from Loft Life, where there is a post showing Calero's West Chelsea loft-- lots more great pictures there. 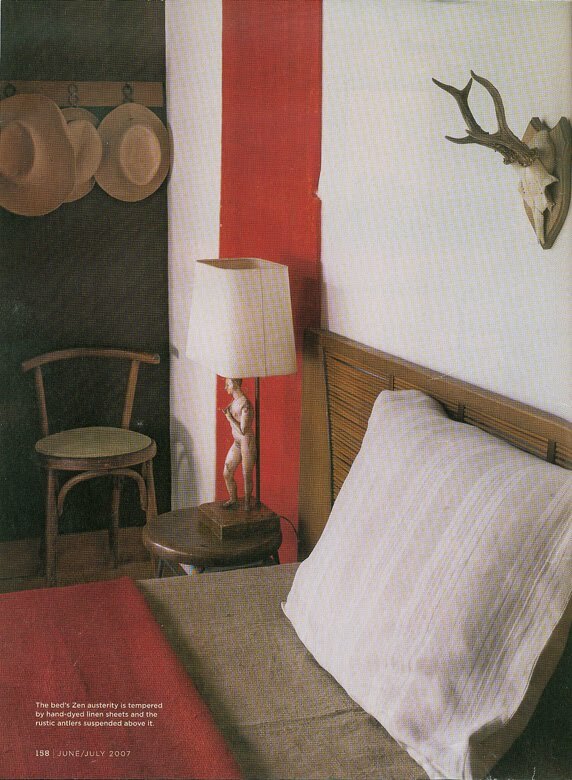 Seeing her aesthetic translated between an urban loft and a mid-century vacation home is really interesting. There are lots of little details that she's used in both places, like the color palette-- pops of red, sage green, mustard yellow with lots of natural wood, the cork front refrigerator, and pieces of nature brought indoors-- shells, turtle shells, branches, etc. 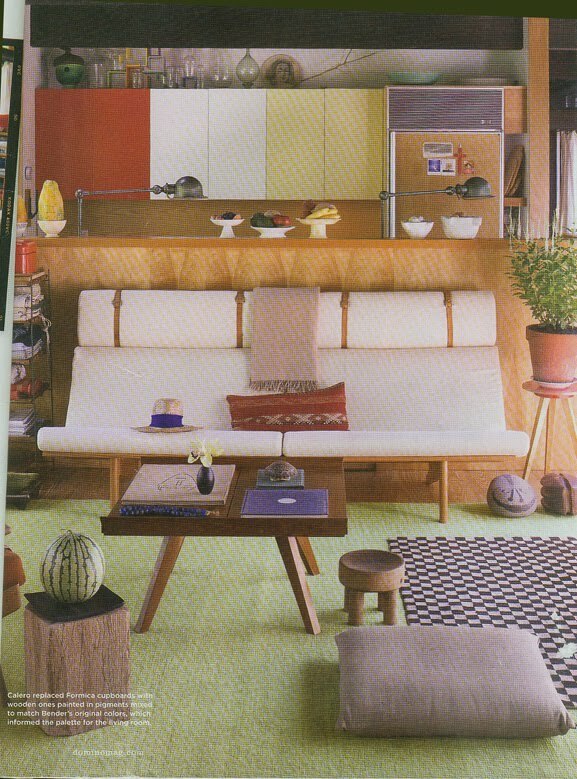 There is also a great post at knitsquirrel that contrasts the Domino spread with another from Martha Stewart Living, and you can see how the space has been rearranged or re-styled between the two shoots. Sigh. Must stop wishing I lived in someone else's house now, and go cook dinner. Anyone want to share their all time favorite homes from Domino? (I also loved Ione Sky's house, which was in one of the early issues). Love this house. 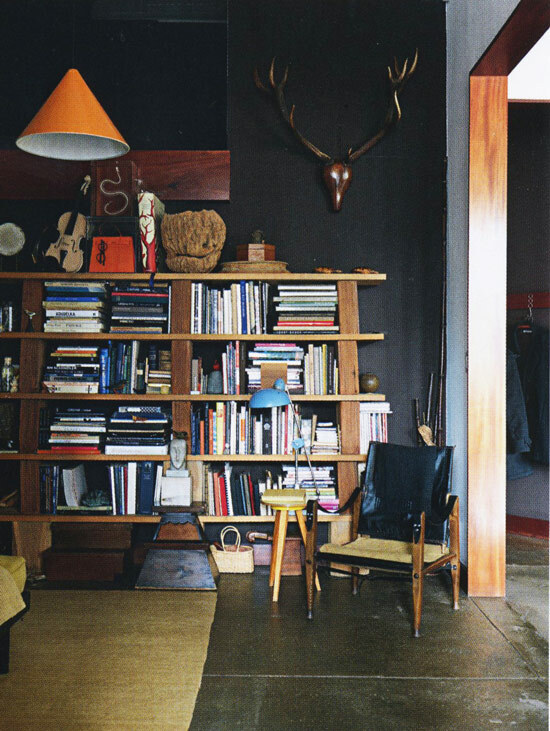 The image with the tall white candlestick, leggy chairs, wood floors and beautiful print is pretty much my ideal room. 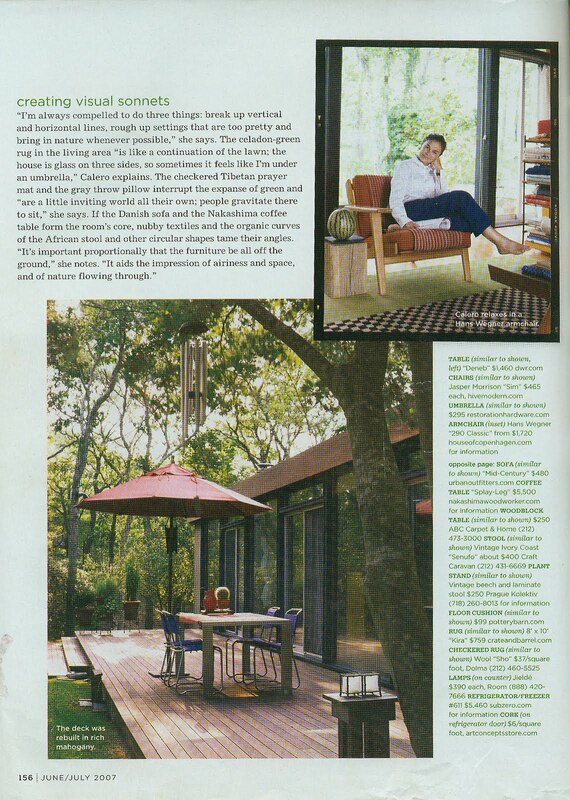 Emma-- I love the house above obviously, but your house is just as lovely! The photo of your modern credenza with the cool painting, plant cuttings in beakers, and perfect daylighting makes me seethe with envy.